Earlier this month I was one of the co-leaders on the Light Explorers' Tuscany In Spring workshop. We spent five days at a fantastic hotel just outside San Quirico d'Orcia with an awesome group of people shooting amongst the gorgeous rolling hills of Tuscany. It's an area I've visited plenty of times but despite knowing the area well it always amazes me how it's possible to find new locations and new compositions in previously visited locations. It's just such beautiful countryside that it really does feel as though there are great images wherever you point your camera. 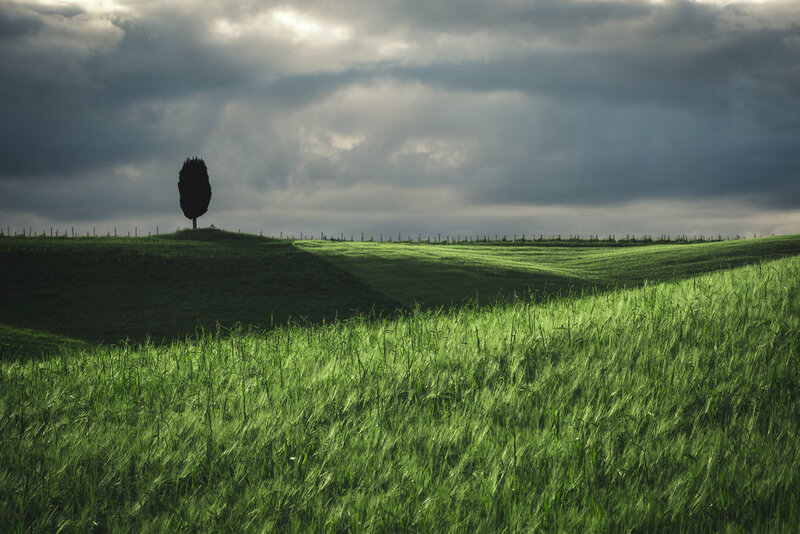 The last light of day picks out a lone tree on one of the many hills surrounding San Quirico d'Orcia. 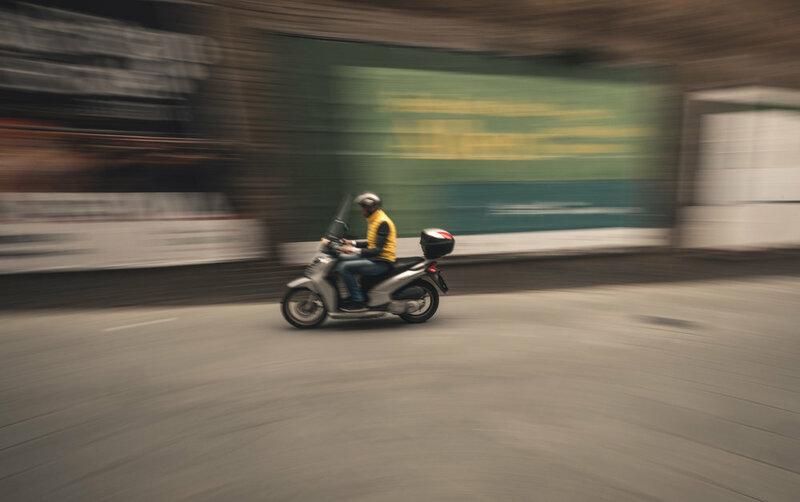 We hit the ground running and after picking the group up at Florence SMN train station we dropped our bags at the hotel and went straight out shooting. Tuscany seems to be blessed with great light most evenings and mornings at this time of year, and it pays to play around with a telephoto lens to try to compress the different folds and layers of the hills as the low light of evening plays across the grass. Sunrise shoots start early in Tuscany and at 5h we were up and heading to the hill overlooking Belvedere farmhouse, which is almost right next to our hotel. The valley here is deep and often has mist but on this particular morning the cold continued into the dawn and the fog never really lifted giving us just brief glimpses of the farmhouse. The evening shootwas much more productive though. In the hills of Crete Senesi we stood above a typical Tuscan view - a winding, cypress tree-lined road leading to a farmhouse atop a hill. The clouds on the western horizon were quite thick so direct light was rare, although we did get occasional beams breaking through the cloud and illuminating the landscape below. The following morning saw us at another icon of Val d'Orcia, again just a short drive down the road from our accommodation. 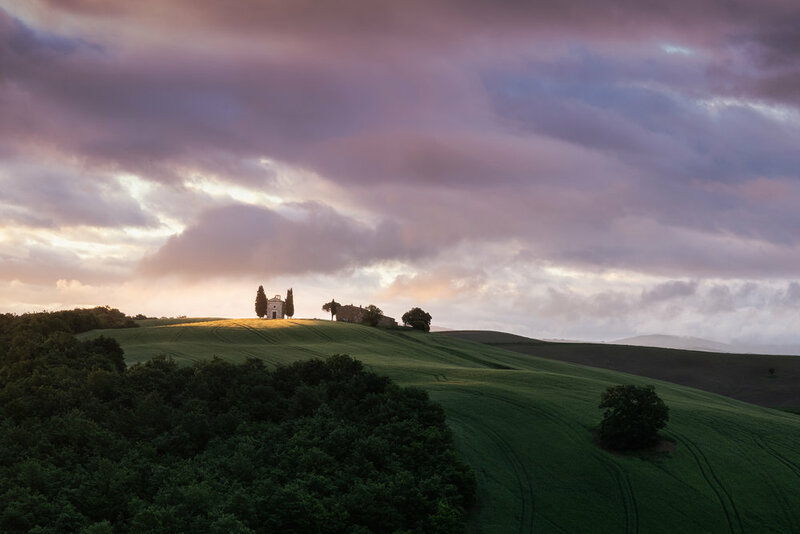 The Cappella della Madonna di Vitality stands flanked between cypress trees on top of a hill and makes for a wonderful scene as the sun rises behind it. We had a particularly wonderful sunrise that morning and some gorgeous light breaking through the clouds. iPhone image of Wolfgang above Cappella della Madonna di Vitaleta in the morning light. We returned to the same location for the sunset shoot, but this time went up close to the chapel to capture it with a wide angle lens amongst the cereal fields and with the day's last light illuminating the stone facade of the chapel. At this time of year it's always impossible to know whether the farmers will have cut the fields or not - I've been here numerous times at the same time of year and often find that some fields are cut one year and not the next. Long fields really add something to the image and make for fantastic foreground interest when shooting with a wide angle. The chapel can actually be captured from both sides and if there is a particularly colourful sky then the view from the rear of the church gives an opportunity to capture it against the sunset. The following morning saw us attempting to capture the Belvedere farmhouse again. This time we chose to shoot it from the grounds of our accommodation which has a viewpoint overlooking the whole valley. On this morning we were unlucky with mist, but the light breaking between small gaps in the clouds was spectacular. It's a short walk from the lookout to breakfast, which is always more than welcome on a workshop. The typical routine for a day in Tuscany is that we shoot from 5h until breakfast at 7h30. After that we have a break for an hour to let everyone freshen up or even grab another hour's sleep before meeting up again at 10h for our morning program. This can involve walking around one of the local medieval towns like Montalcino or Sorano, or doing a session in the hotel on post processing. After that we'll have a big lunch, before having another break of an hour or so. We've found that putting breaks throughout the day help to avoid workshop fatigue as we're often going to bed at 23h and waking up again at 4h30, so a full night's sleep is rare. The breaks in the day give people a chance to catch up on sleep, to switch off or just to get their images off their camera and put into practice some of the post processing techniques we've learned. We usually head out for the evening shooting session around 17h and get back to the hotel around 21h for a light meal and a couple of drinks before heading off to bed. On this evening we headed out to the location of the famous stand of Cypress trees on the outskirts of San Quirico d'Orcia. The whole area here is incredibly photogenic, and once again I had a lot of fun playing around trying to capture a familiar scene in a new way. 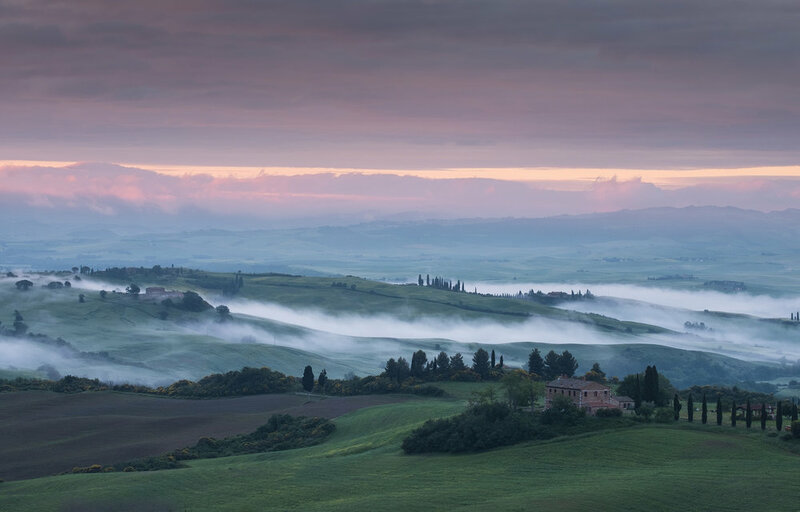 The valley of rolling hills, lush fields and cypress trees just outside San Quirico at sunset. Sunrise the following day was blessed with mist and a wonderfully colourful sky and in the morning we headed up to the beautiful town of Siena. Surprisingly we had quite overcast skies and some rain, but the ochre buildings of Siena photography really well in all kinds of light, and the rain wasn't really strong enough to prevent us from walking around and photographing the streets. Our final evening saw us once again standing in the fields of Tuscany beneath dramatic clouds. There are always new locations to find and shoot, the Tuscan landscape is just so photogenic, and we had a few moments of incredible storm light down in the valley and a fantastic sunset off to the west which I managed to capture while I was flying the drone. You can see images from my trip to the Tuscany in my Italy gallery here.